Operating across three forest ecosystems and eleven research stations within Area de Conservacion Guanacaste (ACG), the parataxonomists are pioneers in a new type of local conservation career. 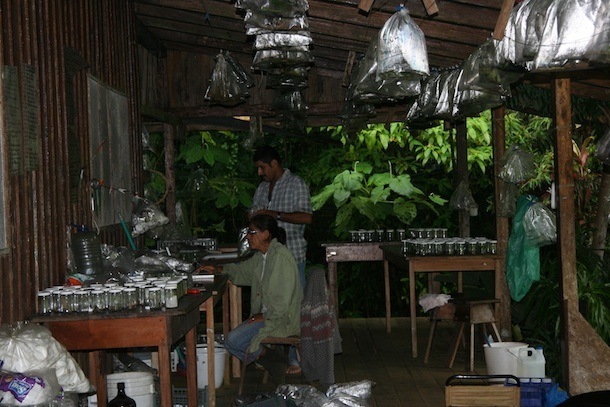 Petrona Rios and Manuel Rios entering data in their office at Estacion Pitilla in the Atlantic-side rainforest of ACG. Estacion Pitilla is one of eleven research stations staffed by parataxonomists across the ACG. Their daily work is searching for wild caterpillars, rearing them until they are winged butterflies and moths, and documenting the caterpillars and the plants that each caterpillar eats with photographs and databases. All this is done with scientific care. 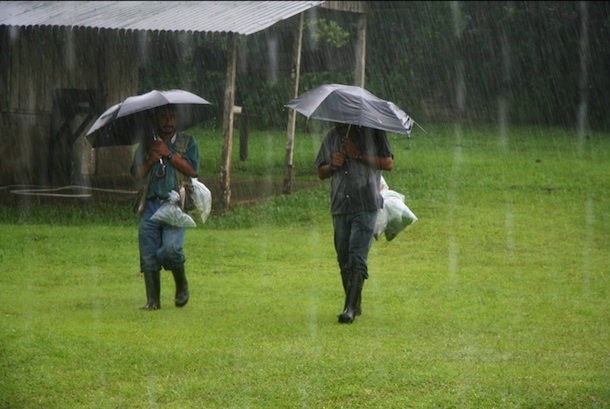 Calixto Moraga and Manuel Rios returning from the forest to Estacion Pitilla. The plastic bags on their belt hold new caterpillars along with leaves of the plants they were eating. 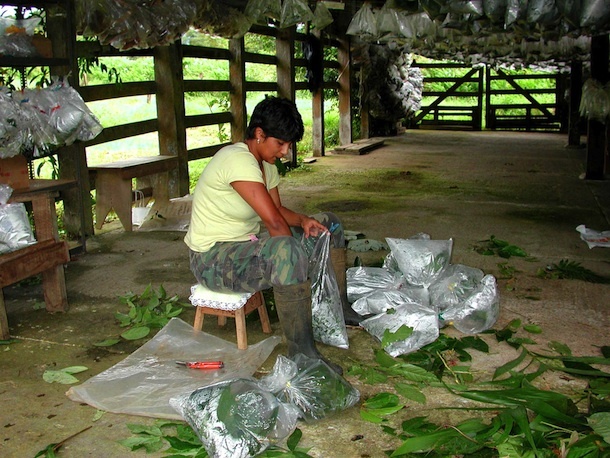 Gloria Sihezar with caterpillar bags in the rearing barn of Estacion San Gerardo. This station is very near the Continental Divide between the Atlantic wet rain forest and the Pacific tropical dry forest and thus a vital "mixing zone" between different ecosystems. She is replacing old leaves with fresh ones for the caterpillar to feed on. Because of them, the caterpillars of the ACG forests are the best studied by far anywhere in the world’s tropics. For the parataxonomists themselves, the career is a release from the life of poorly educated rural people – for men, menial labor in agriculture or on local fishing boats, for women, raising children, getting food, cooking and cleaning in a never-ending competition with other women for the attention and support of men with salaries. Parataxonomy requires constant learning, and they are respected for using their brains. Parataxonomy, like paramedic and paralegal, requires focused training in some of the skills – and the ethics – of a full professional, but without the long years of university and graduate study. In fact, some of them have only a primary school education or less. For some, the training was a bootcamp 6 month course, for others a long apprenticeship to experienced members. The parataxonomists not only find and rear and document caterpillars, but can identify many of the enormous number of species of caterpillars and plants that they interact with, explain the specialized clues they look for to find any species, and now have begun to write species accounts with their own text and photographs for the web. Parataxonomists are hybrids between cultures that have traditionally been distinct, with little information flow and sometimes not even much shared human understanding or respect. On the one hand they are in the world of science, communicating and providing a wealth of new data to global experts in taxonomy and ecology. On the other, they are a part of the neighboring communities, part of the school parents and grocery shoppers and churches and clinic patients with their neighbors, who may have known them all their lives. Acquisition Short history of growth from 3 national parks to the present ACG.